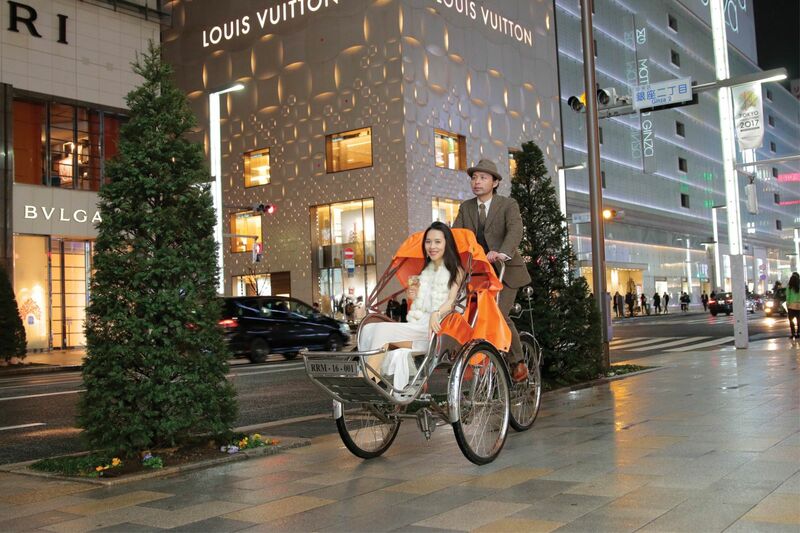 A fancy brand name Cyclo Limousine has joined Ginza in Japan. Despite being a new comer in Tokyo's most famous upmarket shopping and entertaining district, Cyclo Limousine and its founder - a fragile beauty from Hue - Ms. Mai Hoai Giang, have made it to the news in the Japanese media with her special Vietnamese culture start-up. 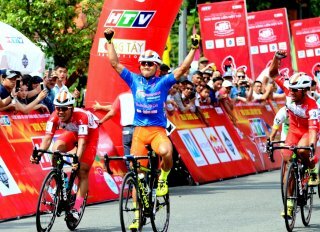 Cyclo is nothing unfamiliar to the Vietnamese. However, what about an image of a ‘chauffeur’ riding the cyclo, wearing a shirt and sneakers, or a lover cycling, taking his sweetheart to admire the cherry-blossom and savour the delicious mochi cakes? Cyclo limousine with its distinct style is the choice to make for those who seek cultural experiences upon their arrival in Japan. Establishing a private company called RAROMA, which runs the Cyclo Limousine system in Ginza (with its head office) is a remarkable effort of Hoai Giang to define herself. “Having spent ten years in Japan, I have seen ao dai (a Vietnamese traditional robe), bun bo (beef noodle), mam ruoc (shrimp paste) but not cyclo. The peaceful picture of passengers enjoying their journey by cyclo under the green canopy of leaves at home has given me the desire to take action. 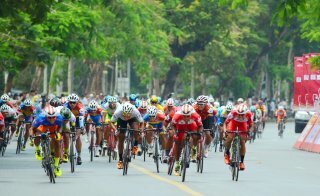 Thus, I returned to Vietnam to conduct a preliminary research; then ordered 5 cyclos and sent them back to Japan by sea. It was fortunate that my husband supported me greatly in repairing and installing a front brake for each cyclo so that it can meet the transportation standards in Japan”, said Hoai Giang eagerly about her initial efforts embarking upon the business. The cyclo drivers, who can be Vietnamese, Japanese, French, American, etc., are well trained to have a thorough understanding of the Japanese culture and the cyclo. The drivers - dressed in a tucked-in shirt or a vest and wearing sneakers - ride the cyclos and at the same time guide the tourists to discover the culture in an “enjoy-the-luxury-time” style. The selection of drivers is quite a painstaking process, as they need to be people with a sense of purpose, open-heartedness, sociability, and the ability to interact with customers throughout the journey. One hour of experience with Cyclo Limousine can cost 6000 JPY, which is over 1.2 million VND. However, its true value lies in the sense of the discovery it brings about in a way claimed in the slogan of Cyclo Limousine. Unlike the prevailing handcart in Japan, the cyclo is not limited to certain fashion styles. Moreover, cyclo passengers are not deprived of their view on the way and the speed is easily adjusted. A special feature of the service is that there are "Cyclos for Couples". After the men have been shown how to ride the cyclo, they can take their sweethearts on a ride around the city, admire the cherry-blossom and take unique photos. Kevin (from England) came across Cyclo Limousine while looking for a special and meaningful birthday gift for his lover. “Giang was extremely amiable, which makes the trip a pleasant and genuine experience. She even took amazing photos for us during the journey. Her profound knowledge and overflowing enthusiasm helped us enjoy the sight of the late bloom of cherry flowers (this is definitely a plus of the service since the bloom was about to end when we arrived in Japan and we thought we would certainly miss the cherry blossom). My girlfriend and I were amazed! We will heartily recommend Cyclo Limousine to those who enjoy exercising and couples who would like some unforgettable memories with a cyclo!," Kevin shared about the experience. Apart from developing private services for RAROMA, Cyclo Limousine also attends Vietnamese cultural and commercial exchange events in Japan, promoting a friendly, welcoming, modern and energetic image of Vietnam as a whole and of Hue in particular. Being the first Vietnamese to be employed in the head office of Fast Retailing (Uniqlo) in 2008, Hoai Giang then moved to work for Atago – a brand known for laboratory equipment, accounting for 90% of the Japanese market and exporting its products to 154 countries. 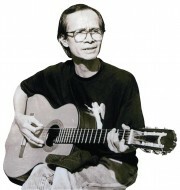 When the company made it to the Japanese newspaper, Hoai Giang was chosen to be the representative figure. However, the fragile beauty from Hue still wanted to challenge herself when she left her job with Atago and set up her own company RAROMA in 2017. “The cyclo itself, with its a classic design, is a charming and exquisite vehicle. I have introduced to my Japanese friends a cyclo endowed with magnificence coming from both its style and the experience it provides customers with, making it a superior product”. This is what Hoai Giang emphasized to her audiences and listeners from all over Japan in all the three times she was invited to be the guest speaker of TOKYO FM. All the reporters who have taken a cyclo limousine ride found the experience really amazing. Many Japanese newspapers also sang their praises for her refreshing way of startup. “We only live once, and that is the reason why I always want to fulfill all my dreams. Whenever I come up with any new ideas, I put them into practice right away. Although Japan is not an ideal environment to start up, especially for women, this does not mean everything is impossible!” It is often said that “Women can’t have it all”, but I do believe with their enormous effort and striving (and a bit of luck), “Women CAN have it all”. Mai Hoai Giang is the only child of a Japanese teacher – Ms. Trần Thị Phương Liên, and a former English class student of Quoc Hoc Hue High School for Gifted Students. 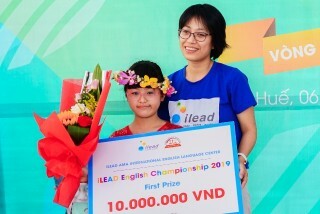 After having won a national prize in English and exempted from the entrance exam to The Diplomatic Academy of Vietnam, she won a full scholarship and became a student of Ritsumeikan Asia Pacific University (APU). She is the only Vietnamese among the 5 founders of the Employment Support and Human Resource Development for Foreigners in Japan Organization – HUREDDE. Sympathizing with her colleague, Ms. Yokoi Nokiro, Hoài Giang’s co-partner in many projects, recalled, “The moment I first saw Mai-san's Vietnamese Cyclo on Japanese streets is still deeply engraved on my mind. It was such a beautiful image I had never seen on any Japanese streets. Wherever the cyclo passes through, either a street in Tokyo or Yokohama, it reminds you of a part of Vietnam. Cyclo Limousine is such a romantic, beautiful and also meaningful project. 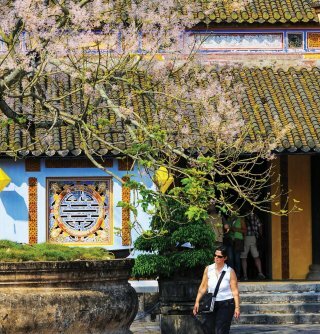 Giang always takes pride in the beauties of the Vietnamese culture, thus aspires to preserve and promote them in Japan. I heartily support her and feel so excited to be a part of this project”. With various investment projects from both countries, RAROMA company’s goal is to build bridges between Japan and Vietnam. 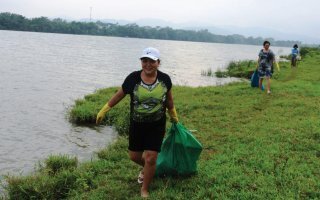 Limousine Cyclo is the first step of the mission to change the world’s view of Vietnam through bridge-building activities and services. There is still a long way to go, and this Hue lady is still on her journey to introduce a professional Vietnam Cyclo’s style to her business partners. Hardly a day goes by without Giang noting down her brainchild’s growing up journey in Japan. And I do believe that, Cyclo Limousine’s diary will be full of more interesting stories about preserving and promoting Vietnamese culture in the Land of the Rising Sun.